We might like to think that this is true but unfortunately we have to go back to the question – ‘Which weighs more? A pound of feathers or a pound of lead?’ Of course common sense dictates that a pound is a pound and therefore they weigh the same. But the important fact is that they do differ in density. 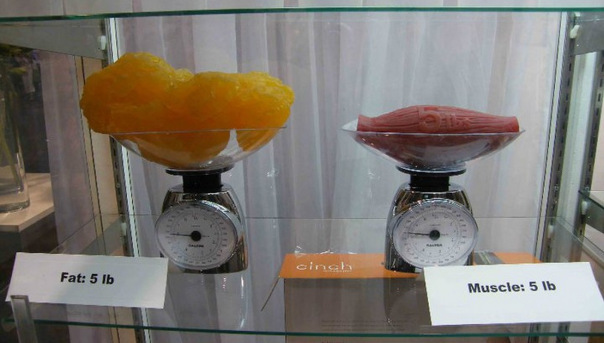 As this picture shows 5 pounds of fat takes up more volume and therefore more space in the body than 5 pounds of lean muscle tissue. So our aim should be to increase lean muscle mass and decrease body fat. Religious attention to the bathroom scales will not give a true picture of what is happening to our bodies since it does not give a breakdown of our body composition. External body measurements, skinfold calipers and how we look and feel in our clothes can be a better guide. Lean muscle not only looks better than fat but it also boosts your metabolism. Put simply, a pound of muscle will burn more calories at rest than a pound of body fat. Further evidence that we should all include at least 1 weight training session per week in our exercise programme. This could comprise free weights, resistance bands or body weight exercises. Enlisting the help of a personal trainer to design a well-balanced full body workout and to ensure that the exercises are correctly performed will guarantee the best results.